Three reasons to choose Mendoza's Paint & Remodeling for Drywall Repair. Experience - Mendoza's Paint & Remodeling has been repairing drywall in homes and buildings since 2001. No job is too big or too small. Mendoza's Paint & Remodeling knows how to repair large and small areas of drywall and is able to work with sheetrock, plaster, and stucco. When Mendoza's Paint & Remodeling repairs drywall, we make it look natural, as though the wall was never damaged. Your home or business is in great hands with Mendoza's Paint & Remodeling's experienced drywall repair professionals. Affordable - Mendoza's Paint & Remodeling drywall repair services are always priced competitively and what you would expect to pay for a quality professional job. Find out today how affordable Mendoza's Paint & Remodeling's drywall repair service truly is. Call today for a free quote. Satisfaction Guaranteed - Naturally Mendoza's Paint & Remodeling guarantees that you will be satisfied with your drywall repair project. The job will be done to your specification and we go the extra mile to make sure you very pleased with your newly repaired drywall. 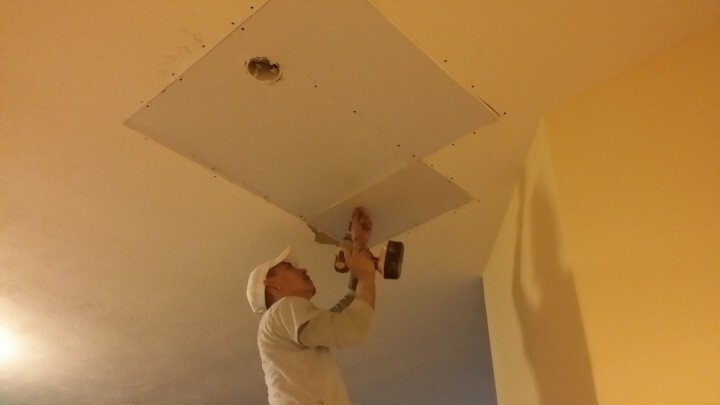 Mendoza's Paint & Remodeling is happy to provide Drywall Repair services. Whether fixing a crack or redoing the an entire home or building, no job is too big or too small. Our expert craftsman have years of experience and can make your house or office look new again. We happily fill in nicks, dents and small holes, and professionally install drywall for large repairs.